Christmas month is here!! I love the colors, the lights, the spirit - everything about Christmas! People are a little kinder and hearts are a little lighter as we celebrate the gift of our Saviour. This is the month I contemplate what has been over the last year and anticipate what is to come. There's just all kinds of good in December!! Speaking of good, I have so many specials to tell you about for December! Starting December 1st at 1:00 am CST, there will be new items on the While Supplies Last section of my website! 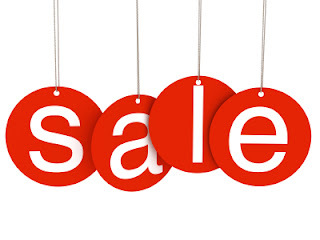 You will find a wide variety of paper and coordinating accessories at a substanial discount. Some of the items are currently available and this is the time you will see a further markdown! I would suggest shopping early for the best selection. I have a feeling that product is going to fly off the shelves!! 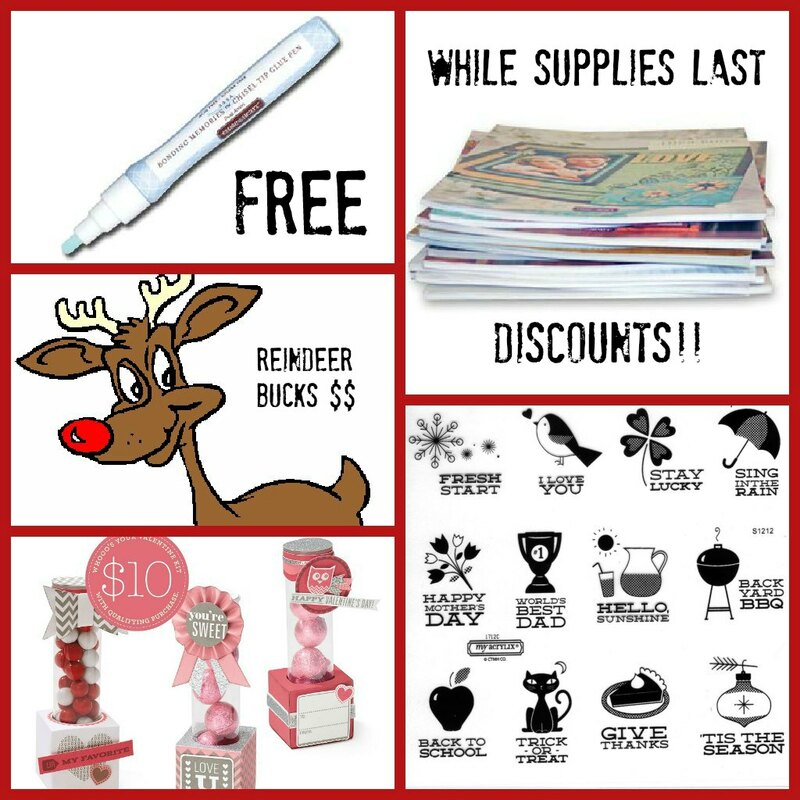 If you spend $50 on an online order during the month of December, you will receive a FREE Bonding Memories Glue Pen! That sweetens the deal even more, don't you think? I love my glue pen for adhering letters and Cricut cuts to my paper crafting projects. 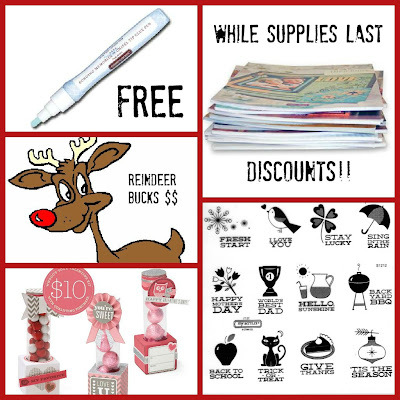 Spend $50 in December and you are also eligible to receive the December Stamp of the Month for $5.00! Year Round Cheer is a wonderful set suitable for cards, pages, and calendar work. REINDEER BUCKS! This is a special available only through me in December! For every $10 you spend with me in December, I will give you $1 back in the form of a gift certificate. So, if you spend $50, you get $5 in Reindeer Bucks! Spend your Reindeer Bucks starting with the new Spring/Summer Idea Book on February 1, 2013. Just. All. Kinds. Of. Good. And if this weren't enough (wow, is Close To My Heart amazing! ), there is a new National Paper Crafting month special starting December 13th! I'll give you more details about this as it closer, but for now let me give you a hint....Whooo's Your Valentine? The special is fun, super affordable, and will be a wonderful winter project for you! There's even going to be a chance for you to get it FREE from me, so stay tuned!! I loved the idea of the Reindeer Bucks! So cute. I hope you don't mind if I borrow it and give you credit.